Twenty-three has always been my favourite number. I was born on the 23rd. In my 23rd year I graduated from university into this writing and editing life. 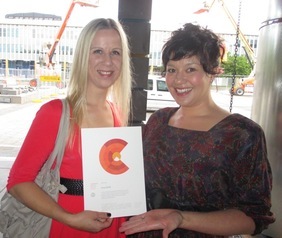 And last night at the 23rd annual Canberra Critics Circle Awards I picked up an award for The Invisible Thread. Earlier that day I had been preparing documentation for the Centenary of Canberra summarising our year of achievements. Most importantly, of course, there is the anthology itself. A collection of 100 years of fiction, nonfiction and poetry by 75 writers with a connection to Canberra. The book has been enthusiastically received by both readers and critics, with Australian Book Review calling it ‘a captivating collection’ and Whispering Gums concluding that The Invisible Thread ‘should be on every Australian bookshelf’. I can’t think of a better endorsement than that! 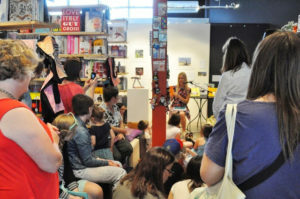 In addition there have been a series of video interviews with Invisible Thread authors, a book trailer, an animation of Judy Horacek’s illustrations, eight incredible events featuring so many of our authors, and the creation of the ACT Writers Showcase website, the first site of its kind in Australia. Needless to say it has been a busy and wonderful year. I’ve had the good fortune to share it with the dedicated anthology Advisory Committee and all the authors who make The Invisible Thread such a special book. And to receive a Canberra Critics Circle Award is a grand way to top it all off, particularly given that it was alongside Thread authors Lesley Lebkowicz (for The Petrov Poems) and Robert Macklin (for Dark Paradise), as well as that super talented crew from Scissors Paper Pen. To read about the full list of award recipients across all art forms see this article in The Canberra Times, and for photos of the night click here. 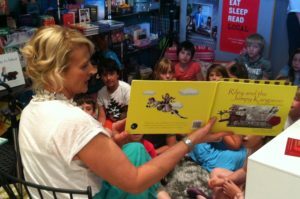 On Saturday I got to spend the afternoon with authors Jackie French, Tania McCartney and a bunch of book-loving children. Frankly, it doesn’t get much better than that. Here we are just hanging out in front of a gorgeous window display of our books, as you do. Electric Shadows Bookshop was made cosy with fluffy rugs and lots of cushions (my daughter appointed herself chief stylist). And it turned out to be an afternoon filled with wonderful stories and lots of laughter. Tania was up first and read her latest releases, An Aussie Year and Riley and the Jumpy Roo. My two year old is so obsessed with this Riley book (the fifth in the series) that for Halloween he dressed as a roo (except that he got so over excited bouncing everywhere that he broke his ears and then had to settle with being a random zebra instead). My turn next. I read one of my two Bugs and Beasts books, published by the National Library of Australia, which was great fun. And then my latest book, Megumi and the Bear. Whenever I read this story the crowd descends into silence. There’s something about the sadness and longing of Megumi, so beautifully expressed in Craig Phillips’ watercolours, that takes the audience into a quieter, reflective space. Tania declared it ‘a lovely pause of beauty and enchantment’. I like it! Finally, Jackie read Wombat Goes to School. I’ve never seen Jackie read one of her wombat series and I felt like a big kid, giggling with the rest of them. These books have been a favourite with my kids and they are such fun to read. Jackie helped the children discover if they were wombats in disguise (here they are checking if they have furless noses). Now, if only I could scratch my ear with my foot (like some of the wombats in disguise could). We wrapped up the afternoon signing books and chatting with readers young and old (always one of my favourite parts of any event). The kids gorged themselves on sugary treats (there were so many that while we packed up my daughter took it upon herself to hand out leftover honey joys and biscuits to passersby!). A big thank you to Electric Shadows Bookshop for hosting, and to my fellow authors, Tania McCartney and Jackie French, who made it such a pleasure. For more photos visit my Facebook page here. And if you’d like to read Tania McCartney’s take on the event and check out all her fabulous piccies click here.